In my life-story devotional, readers will learn how salvation radically changed my life, healed my marriage and family and restored my soul as only God could do through His life-changing love, grace, mercy and power. Anyone who has ever lived through the hardships of life will connect with Margo Fieseler’s book “Unwavering” in some way. An abusive marriage, coping with loss, dealing with infertility, and navigating the often-trying world of adoption, Margo has navigated these challenges with God by her side. “In my life-story devotional, readers will learn how salvation radically changed my life, healed my marriage and family and restored my soul as only God could do through His life-changing love, grace, mercy and power,” Fieseler said. Though Fieseler faced numerous struggles throughout her life, she came to rely on her faith in God as a way to persevere and come out stronger than before. In this authentic and vulnerable narrative, readers will study the Bible’s application in their own life through devotions and journaling to discover the key to walking victoriously, rather than in suffering. 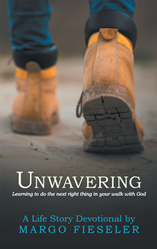 Peppered with 52 inspiring and engaging devotions, “Unwavering” guides readers to understand God is always in pursuit of their faith and love, because of His love for them and His desire to have a relationship with them. “Unwavering” provides a gentle reminder that their hardships and missteps do not define who they are, but rather lead them to a better and more faithful life. About the author: Margo Fieseler is the president of Margo Fieseler Ministries, Inc., and an expository teacher of God’s Word. Fieseler’s fervent desire is to teach women to know Jesus personally, passionately, powerfully and pre-eminently. As part of her ministry, Fieseler teaches four weekly bible studies, publishes a daily devotional called “Right Word at the Right Time” through her website and supports and partners with organizations like Samaritan’s Purse through its Operation Christmas Child outreach and Fort Wilderness Ministries. MFM also works closely with regional Wisconsin YMCAs and holds three large events annually – Christmas outreach, spring conference and fall retreat – which each attract 800 to 1,000 women. Fieseler is a well-received speaker at women’s retreats, churches, banquets and anywhere else God calls her, and she previously served as an on-air radio personality for five years at 105.3 The FISH, (now K-LOVE). Fieseler holds a bachelor’s degree in special education from the University of Wisconsin-Oshkosh, and she has more than 20 years of experience in the marketing industry. To learn more, please visit http://www.margofieseler.com and connect with the author on Facebook and Twitter.